You’ve seen the class rings salesman come and go from your school. You didn’t buy a one of those beautiful girls class rings. We understand. Sometimes you don’t know what you want until you see it out there. Sometimes, class rings are just too dang expensive! 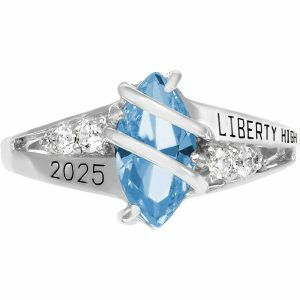 We wanted to show you a beautiful class ring that won’t break the bank – our girl’s Seaswirl class ring, starting at only $219. All of our class rings can be customized, and that includes your birthstone. So, whether you are ruby, alexandrite, emerald, aquamarine, tangerine, amethyst, rose, tourmaline, topaz or peridot, we have you covered with the perfect gem stone for your ring. Click here to shop all of our girls class rings. At WearMyStory.com, we offer a great selection on class rings for boys and girls. We believe high school is a special time in someone’s life. And, we also believe that everyone’s story is different. One of the great things about a class ring is that it can serve as a milestone marker for you and your life as well as tell a custom story about who you are individually. Birthstones are a great way to do that with your ring. So, if you are looking for a great girls class ring with fantastic prices (we’ll match anyone else! ), then shop at WearMyStory.com. also now works with Linux and Chromebook for immediate messaging interaction (no video and voice however, these call for a plug-in installation).